Chris Castiglione Follow Teacher at One Month. Faculty at Columbia University where I teach Digital Literacy. I write about coding, the internet, and social impact. One skill that most people need in business is writing. Entrepreneurs working on their own will find themselves writing emails, proposals, blog posts, social media posts, on a regular basis. This is why developing your writing skills as an entrepreneur is essential. In this post, I’ll share my top 10 ways to improve your writing skills. When it comes down to how to improve your writing skills it can be hard to know where to get started. The best way to refine any skill is to practice it. With writing, you should be practicing daily. Chances are, you already are as you are replying to emails and sharing social media updates. If not, then you need to start. Your daily practice can include writing that is shared with others like blog posts, social media posts, and comments on articles. Or it can include writing that is for yourself only, like Morning Pages, a three-page handwritten stream of consciousness done every morning to reduce stress and anxiety. If you can’t muster up the enthusiasm for writing about your business, that’s ok. Write about other things that you are passionate about (although hopefully, you are passionate about your business too). Write articles on a personal blog about your favorite hobby. Write social media posts in groups about a particular interest. Write comments on entertainment and technology blogs that you visit for fun. As you write more, you will find one of two things. You will find that the more you write, the easier it gets or you will find that the more you write, the more you need to polish your writing skills. If the latter is the case, definitely try the following. If your writing falls into the realms of something people want to read or something people need to read, then you will have a successful piece of writing. Better yet, you will be more motivated to write in the first place because you will know that someone out there will consume your writing. Here’s a handy guide to determining if your writing is what people want or need to read. For example, let’s say you’re working on a blog post. How do you figure out if it is something people will want or need to read? You can use tools like Impactana to help. Start by signing up for an account and searching for the topic of your blog post. Then click on the Impact rating next to blog posts similar to the ones you were thinking about writing. The number of views will show you if people actually cared enough to view the content. This tool will also show you things like number of backlinks (for SEO value) and number of social shares so you can further determine the popularity of your topic. Alternatively, you can just do a Google search for your topic, click on the top articles, and see what kind of engagement they get in the way of social shares (usually shown next to social buttons on a blog post) and comments they receive. You can also use Q&A networks like Quora and Yahoo Answers to see what people ask about often related to your topic. Note that some topics might fall into the “need to read” category, but not necessarily be popular, or terribly interesting for that matter. Take insurance. No one gets excited about reading or sharing articles about insurance with their friends. But if you’re thinking about buying your first house, you’ll want to do some research into different types of home insurance. If you have a friend who is buying their first house, you might share articles you find with them. KISS stands for Keep It Simple Silly. When it comes to writing, the simpler you make it, the better. Make your point and move on. You shouldn’t be focused on word count as much as you are focused on whether your reader will be able to get what you are saying and take value from it. There is nothing that can stall a good writing session like obsessing about spelling, grammar, order, outcome, and anything else besides the process of writing itself. Focus on getting your thoughts out on paper or in your document first. Edit once you are finished. If you have trouble doing this, then try dictation software. Dragon software will allow you to say whatever is on your mind and write it out for you. You will have to do some editing work after, especially until you get used to verbally adding in punctuation and new paragraphs. But ultimately, it can help you write faster. Most text editors and word processors like Microsoft Word or your browser have a built-in proofing tool that helps to correct basic spelling and grammar. But the problem with these built-in tools is that they miss a lot of mistakes and teach you little about the mistakes you are making. 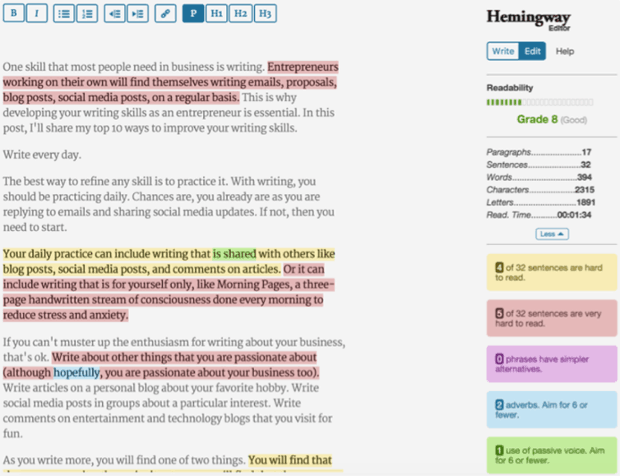 Grammarly and Hemingway are the best alternatives to hiring a professional editor for your writing. They are online editors that can help you improve your writing by identifying specific writing errors, letting you know why they are errors, and helping you correct them. 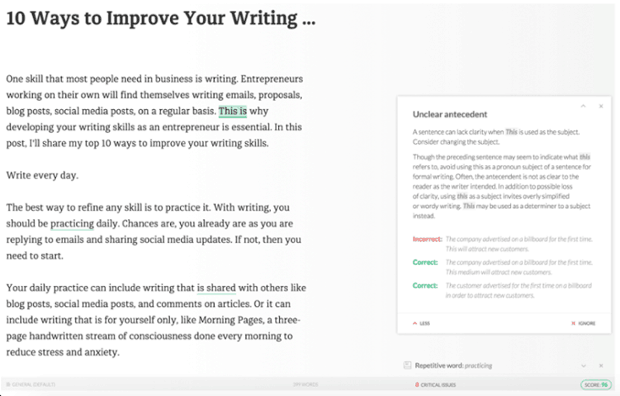 Grammarly’s premium version allows you choose from a variety of settings based on the type of document you are writing. Additional benefits of using Grammarly include the following. You can save your documents in Grammarly as to refer to the fully edited versions later down the road. You can install the browser extension and get Grammarly editing advice in different applications (like Gmail and Facebook). While you can save documents in Grammarly, I’d suggest writing in a different word processor (like Microsoft Word or Google Docs) and copying / pasting your text to Grammarly and back to your word processor. That way, you always have your document, whether or not you choose to maintain your Grammarly account. Hemingway, on the other hand, is a free tool that offers similar advice, but in a more simplistic manner. You can’t save your documents in this editor or use it in other browser applications. But you can toggle between write and edit mode so you can focus on writing, then focus on editing. Even after you have done a full online editing of your writing, you should give it a final test by actually reading your writing out loud. There are some things that might be grammatically correct, but unnatural otherwise. If any portion of your writing is difficult to say out loud, then it might need to be rewritten for better clarity. Alternatively, you can have someone else read your writing out loud to you. Being the recipient of your own writing could help you further improve it. To get the best writing examples to study, look for writing done by those who write for your target audience. Subscribe to your competitor’s blog posts and email newsletter. Read the sales letters and landing pages on their website. Follow their social media posts. See if they published their investment pitch deck on Slideshare. When reviewing your competitor’s writing style, ask yourself a few questions. Is the writing formal or casual? Is the writing serious or funny? Is the writing verbose or succinct? Is the writing first, second, or third person oriented? Is the writing text heavy or light? Be sure to analyze the writing of multiple competitors or others with the same target audience. That way you don’t model yourself after the one misfit in your niche or industry. Templates are the answer to writing efficiency in business. Whenever you find yourself writing a similar document repeatedly, creating a template for that document will save you time (and frustration if you are not particularly fond of writing). Email templates are going to be a huge timesaver for most entrepreneurs. Each time you find yourself looking back through your email archives to copy an email you sent to one person and paste it to send to another, that email content should become a template. When using templates, pay attention to personalization fields throughout the template so you don’t address someone by another name or reference something from a different intended recipient. While templates can be great productivity boosters, they can also lead to some embarrassing blunders as well. Use them carefully! If you liked science in school, then you will love A/B testing. When it comes to writing, there are lots of different things you can test. Start by defining your goal for a particular piece of writing. Here are some common goals for common types of writing in business. The goal of your proposal will likely be to get funding for your startup. The goal of your outreach email will likely be to get a blogger to write about your startup. The goal of your blog post will likely be to get lots of social shares. The goal of your sales page will likely be to get more sales. Once you have defined your goals, you can start doing some testing with your writing to see what versions of your writing produce the most conversions, or goal completions. Start by changing the areas that are going to make a first impression in your writing: headlines, subject lines, bolded headers, and calls to action. Change one element at a time so you can compare the results. For example, you can send 50 emails with one subject line and 50 emails with another subject line to determine which email received the best response. Once you know which one works, you can move on to testing different portions of the email content itself. Eventually, you will have an email that is scientifically proven to get the most conversions. For A/B testing in direct email correspondence, you will need CRM tools like Salesforce. For your website, Optimizely, VWO, and Nelio are a few tools that will measure the results of your A/B testing so that you can quickly identify the best writing on your landing pages to accomplish your goals. For email newsletters, several email marketing services offer A/B testing options for headlines and other aspects of your email content. These include GetResponse, MailChimp, and ActiveCampaign. Don’t let the cost of investing in tools stop you from testing your writing. You can always go with good old paper and pen analysis to get good results. If you are truly interested in improving your writing skills, take some time to study the art of writing itself. You can focus on business writing or expand your mind into the creative side of things. You will find lots of great books on writing on Amazon. If you prefer to learn while you commute, you will also find some great books on writing on Audible. You can even take a free course on High-Impact Business Writing from the University of California via Coursera. When it comes to writing, there is always room for improvement. 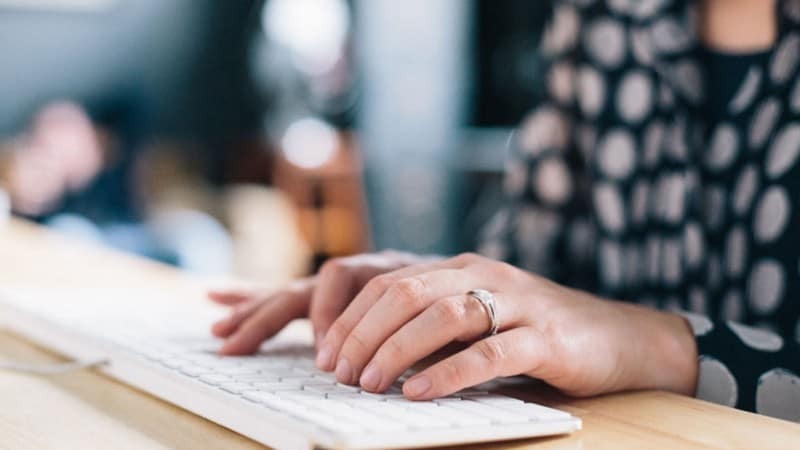 Even if all you do after reading this post is invest in the professional online editor, you will have made a great investment in the future of your business through better writing.